They are incredibly easy to keep clean, their water resistance means that even spillages can be dealt with swiftly with a mop and they will look as good as new. Incredibly hard-wearing, you’d be hard pushed to damage this flooring but if you ever managed to, the relevant individual tile can be replaced, no need to pull the whole floor up. Perfect for any room including kitchens and bathrooms, these durable tiles are ideal for even the most hectic of households with lots of traffic. So if you want to create a high-end feel to your home with a luxurious feel and excellent usability, luxury vinyl tiles are just what you are looking for. Thanks to their stain qualities, vinyl tiles are a very functional choice and can be used in wet areas such as bathrooms or kitchens. But there’s no need to sacrifice style for practicality, as with vinyl tiles you really can have it all. 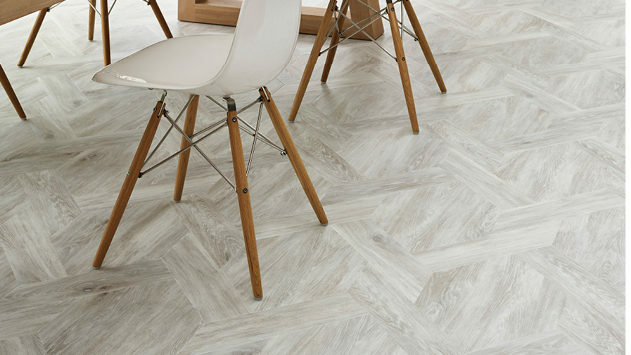 With a wide variety of designs, colours and finishes of floor tile available, you’ll be spoilt for choice, so bring out your indulgent side with luxury vinyl tile flooring. There are two main types of vinyl tiles which differentiate in the way that they are fitted. Dry back vinyl tiles require adhesive to be applied to the sub-floor whereas, Click vinyl tiles use an innovative click system which means the tiles fit together easily, creating a floating floor surface. To help you decide on the right luxury vinyl tiles for your home, call us for a no obligation home visit, that way you can see how each of your preferred luxury vinyl tiles will look in your chosen room and see which compliments your home.